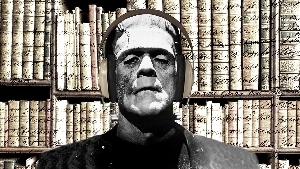 Wed, March 6, 2019 12:00 P.M.
A unique experience retelling the story of Frankenstein and exploring his world through a series of extraordinary objects. Created by Pure Expression, Frankenstein is played by the outstanding voice artist, Paul McLaughlin, and the soundtrack was created by the award-winning musician Taz Modi. The Free Library of Philadelphia is fortunate to be among the few select library systems in the United States to host this event direct from London, England. "It was amazing. I felt as if I was in a completely different world." "I was fully immersed in the story and deeply moved by the plight of the creature." Location: Literature Department of Parkway Central Library.